To what have Putin and Erdogan agreed? 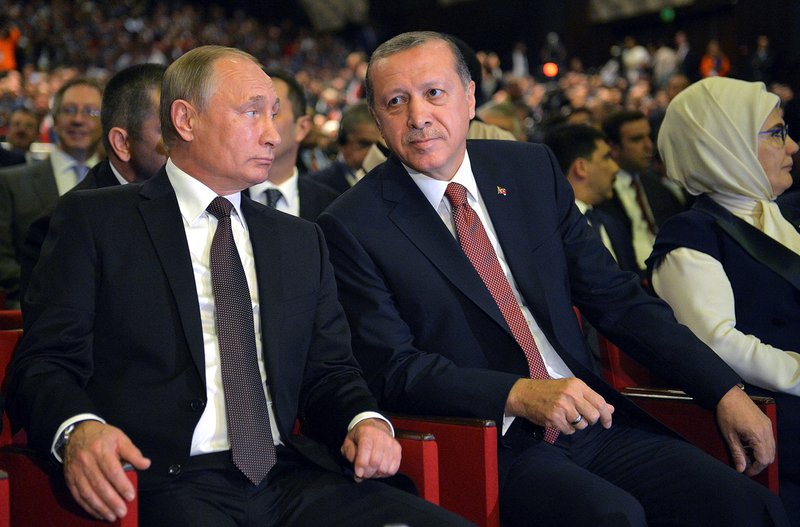 Russian President Vladimir Putin (L) and Turkish President Tayyip Erdogan attend a session of the World Energy Congress in Istanbul, Turkey. While Moscow and Ankara have considerably differing positions on a range of issues, the presidents of Russia and Turkey have come closer to normalizing relations after their meeting in Istanbul. Russian President Vladimir Putin met the Turkish President Recep Tayyip Erdogan in Istanbul on October 10, on the sidelines of the World Energy Congress. It was their third one-on-one meeting following Erdogan’s apology in June for Turkey’s downing of a Russian Su-24 bomber along the Turkey-Syria border in November last year. The leaders agreed on three important issues at the meeting: the fate of the Turkish Stream pipeline, bilateral trade relations and the situation in Syria. At the meeting, Putin and Erdogan signed an intergovernmental agreement to move forward on the Turkish Stream gas pipeline, which had been in limbo practically since agreement on its construction was first reached and signed in December 2014. The Turkish Stream was conceived as another route to move Russian gas to Europe without going through Ukraine, after the South Stream gas pipeline project through the Balkans collapsed. The project has been bogged down from its inception, however, over such questions as the number of pipeline strings and speculation on the possible resurrection of South Stream. The sharp deterioration in bilateral relations between Russia and Turkey after the aircraft was shot down last November only delayed the project further. During the meeting in Istanbul, however, Russia and Turkey managed to finish what they had begun, signing an inter-governmental agreement on the project. Additionally, Russia and Turkey agreed on a discounted price for gas within the framework of the project. After the meeting Putin said: "We are moving towards realization of the Turkish president's plans to establish a major energy hub in the country." Emerging from his meeting with Erdogan, Putin stated that Moscow would again allow agricultural products from Turkey into the Russian market. Putin said the decision was a mutually beneficial one, particularly mentioning the importance of Turkish citrus and stone fruits for Russian consumers. "Russian agriculture does not produce such products, and the supply of Turkish ones to the market may lead – and we are looking forward to it – to decline in prices of these products," President Putin said. He added that the move was also good for Turkish producers, noting "sales of these Turkish goods in the Russian market last year amounted to $500 million." While agreeing on issues of economic cooperation, the two leaders found ways to agree to disagree about Syria. Both countries are physically involved in the Syrian conflict. Russia is conducting air strikes in the country in support of Syrian President Bashar al-Assad and against ISIS militants, while Turkey is carrying out ‘Operation Euphrates Shield’ in northern Syria against ISIS operatives along the Turkish border. Turkey is also fighting the Syrian Kurd militia, which Ankara alleges has ties to the Kurdistan Workers' Party (the PKK), the Kurdish separatist organization that the Turkish establishment has been fighting since 1984. The PKK is recognized as a terrorist organization in Turkey, the U.S. and E.U. countries. Turkey also supports the anti-government forces and describes the Assad regime as nothing short of terrorist. Yury Mavashev, head of the political section of the Centre for Modern Turkish Studies in Moscow, said Russia and Turkey have arrived at a tacit agreement not to interfere with each other’s operations in Syria. "Russia and Turkey agreed on the Operation Euphrates Shield during President Erdogan's visit to St. Petersburg back in August," Mavashev said. "Moscow expressed almost no emotion during the start of the Turkish operation in Syria." Mavashev added that the discussions during Putin's visit to Istanbul just reaffirmed the status quo. "Turkish officials and the media are silent about the Russian involvement in the affairs of Aleppo," Mavashev said. "They were given the command – 'we do not care about Aleppo since Russia gave us the north of Syria.'" Kerim Khas, a specialist on Eurasian politics at the International Strategic Research Organization, an independent think-tank in Ankara, said the leaders did find common ground on non-military matters regarding Syria. ''Actually, the main concrete issue that President Erdogan and President Putin agreed about on the Syrian crisis is the continuation of the positive agenda and negotiations through the direct official high-level tripartite mechanism, which was established between the Ministers of Foreign Affairs, General Staffs and the Intelligence Agencies. The situation in Aleppo, the humanitarian crisis in Syria and the differentiation of opposition groups from terrorists will be discussed through this mechanism,” Khas said.